Home - ATT , News , Prepaid Data - GoPhone $60 Plan Getting Unlimited Data? GoPhone $60 Plan Getting Unlimited Data? Unlimited Talk, Text, and Data with first 2.5GB at high speed. All data usage over 2.5GB will be at 512Kbps or less speed regardless of device speed capability. Additional 1GB for $10 high-speed data package is available. It is recommended that you use most or all of the data in your plan before adding a data package." Up to now data on the $60 plan has been shut off after 2.5GB has been used, with additional high speed data available by paying $10 for 1GB. Getting unlimited throttled data at no extra charge after the high speed allotment is a nice improvement and should help GoPhone compete with the likes of T-Mobile Prepaid, Boost Mobile and Straight Talk, all of which offer unlimited throttled data after their high speed allotment is used up. 512Kbps is fast for a throttled speed too. Boost and T-Mobile Prepaid throttle to 128Kbps and Straight Talk's throttle is even slower with some users reporting 40 Kbps speed tests. 512Kbps is plenty fast for Web browsing and streaming music and might even be fast enough for YouTube. Unfortunately, I haven't been able to confirm whether the change to unlimited data is in effect yet. Other pages on the AT&T site (like this one) still say data is capped at 2.5GB. I chatted with a GoPhone support person who didn't know anything about the change to unlimited data. One HoFo'er was told by a customer support manager that the plan change goes into effect Nov.12. I've contacted AT&T's press relations department asking for clarification and will update this post when I hear back from them. 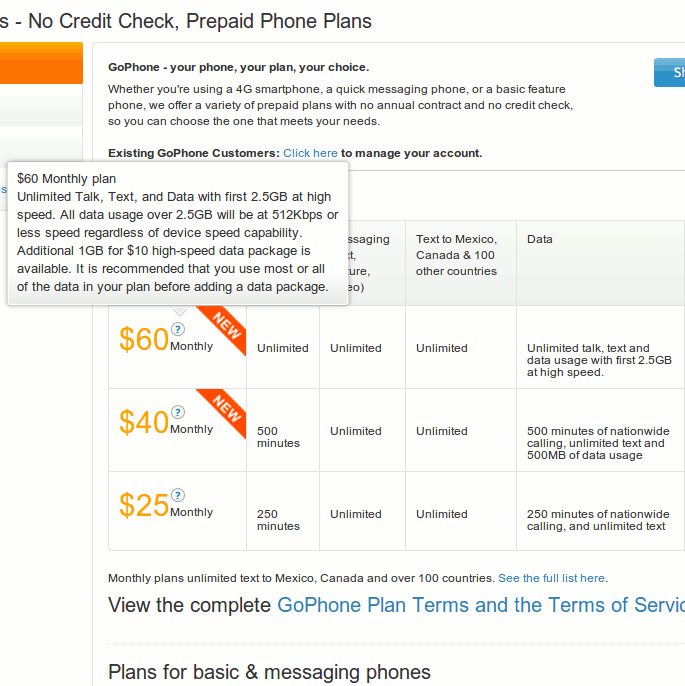 Update 10/31: AT&T has rolled back the site changes removing all references to unlimited data on the $60 GoPhone plan. I suspect the Website was updated prematurely. Hopefully the the change to unlimited (throttled) data will still happen on Nov 12. Update 11/12: AT&T customer support is now reportedly telling customers the switch to unlimited data will occur Nov. 19th. I have a dormant 45.00 walmart plan includes 1GB high speed data. be nice if this plan went unlimited with 512kbs throttle. I looked my account on line and seen the plans list to change to. 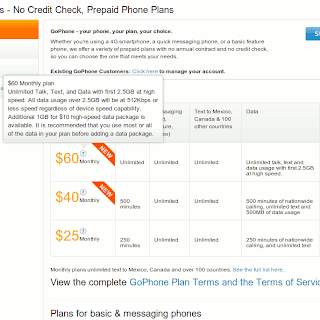 The 60.00 plan does not show, what is on here or ATT gophone plans page. This Plan is called the "$60 Monthly Unlimited w/Data". Do not forget it also INCLUDES/enabled Wi-Fi Hotspot capability to share included data with other devices.This is a seriously sweet deal,especially with CallingMart discount codes! Uh, yawn, Data speed is important to me. For 61.47 per month, I get 3.5 GB of data and whatever I don't use beyond 500mb rolls over for 90 days. You're overpaying by a LOT. Cricket has 10GB for $55 (tax included) and you get 8mbit LTE. Bring your own device. Data speed at 512kbps is useless to me. I'd rather pay 61.47 using the discount code ca3p-1207 at CallingMart and have unlimited talk, text, and 3.5GB of data on Verizon ALLSET. Yawn! Wake me up when they give you a "real" data cap like 50GB, then I'll jump ship in a New York minute. Good luck finding a US carrier with that! I think people are missing the point here. That price point is pretty competitive and a lot of carriers/mvnos throttle after high speed data is used up. However, they throttle around 128kpbs a few years ago the standard was around 256kpbs. The fact that At&t increases throttled speeds to a comfortable standard site browsing experience of 512kpbs is HUGE. Not everybody needs high speed unlimited data. A lot of people have wifi at work, school, or home. Add the fact you get At&t store and customer service phone support and coverage could be enough to get people to switch from a rival or even a At&t mvno. Sorry, I'm not going to celebrate a mediocre improvement. I remember having 512kbps frame relay back in the day. How about throttling to 5mb down and 2.5 up? I agree with mloudt. There are tons of users who don't live on their phones. You are practically forced to get a smartphone now a days as the feature phone choices are drying up and are of poor quality. I never use more than 1 gig. A higher speed throttle is very appealing to me. I hope the Walmart only plan and the $40 plan get this higher throttle. Just got back from an AT&T Wireless Store. CS Rep has not heard or read(through his salespersons POS tablet) any Plan update to the $60 Monthly.He scrolled through his "sales associate access only"corporate news.There was nothing there.I did by the way show him the paragraph that shows up after hovering over the "?" mark.This Plan is probably not in effect yet until a later date,even though we found out through a sharp-eyed reader. I saw it. Basically the same info as here. ATT Cricket offers 10GB for $55 with auto-refill and all taxes included. This change to GoPhone doesn't seem to be a breakthrough to me. Well, if you absolutely need those first 2.5 gigs to come in faster than 8Mbps, or WiFi tether without all manner of bootloader cracking and rooting, it might be worth it. I do agree that 7.5 more gigs at 8Mbps vs 0.5Mbps seems like a high price. I'd much rather have more full-speed data. You can -- buy a postpaid plan. Sheesh. LTE spoils people. I'd say 512 k is a respectable high speed data option. over a dozen times better then Tmobile and over four times better then any other existing throttle. FYI, just a few minutes ago AT&T removed the "512Kbps or less" verbiage changed it back to the original "2.5GB Add more: $10/1GB"
So they did. I suspect the change was posted early and that we will still see it again Nov 12. Umm, yea, that blog post was over a year ago. Things change alot in a year. Last time i Checked, verizon had 115 Million Post/Pre Subscribers. there are STiLL Millions and a very High Percentage of their subscribers that are still using less than 2GB of data/Monthly. i sure the Percentage in the blog post probably has come done as more subscribers have moved over to 4gG LTE devices,which tend to use more data due to the ovious. Yes 512K is reasonable considering that Most Internet Radio Stations stream at 128K and at 512K there is enough headroom that will allow a non buffering stream. If you loading a page with lots of graphics or maybe sending and receiving pictures you know Facebook it may be slow. but for some of us including myself who uses the smartphone to monitor my station while away its good to know that even if I kill my high speed data I can still use the smartphone for what I bought it for and that is for my Internet Radio station. I'll tell all my webcaster friends when this takes place and I can see tons of go phones being sold to Internet Radio station operators nation wide. Good Work AT&T you may have gave me a reason to switch. Anyone know what US Cellular prepaid's throttled speed is? Not sure what all the excitement is about. It says "512K or less." The "or less" could be anything. Why the assumption that it will be at 512K? Sounds like there is plenty of wiggle room there to be able to say they have "unlimited data" while not really providing a useful data stream. There is wiggle room, but we'll find out soon enough whether or not they let subscribers have 512kbps or not. Plus, any throttle without a hard cap is a bonus, right? Well unlike Tmobile's $45 plan at a 2gb hard cap, this lets you actually use data over your allotment , and on at&t's network for a whopping $15 more a month. T-mobile also has a $30 100 minute unlimited text 5 GB before throttling, and it even allows for Music Freedom. Use Google Hangouts and you got yourself unlimited talk text and 5 GB of data for $30 a month. woah 512 KB throttle thats killer. thats like 4x higher than other throttle rates. Lol...gophone throttled is fastervthan sprint 3g! Any update on this yet? It would be great if this can be confirmed. I am on the GoPhone $60 plan and it would be great to stop worrying about running out of data while watching videos etc. The change to unlimited data seems to have been delayed. One Howard Forums user saya a customer support agent told him yesterday that the change would happen Nov. 19. There's been no official announcement so that date may change. I do believe that unlimited data will come to the $60 plan sometime this month.